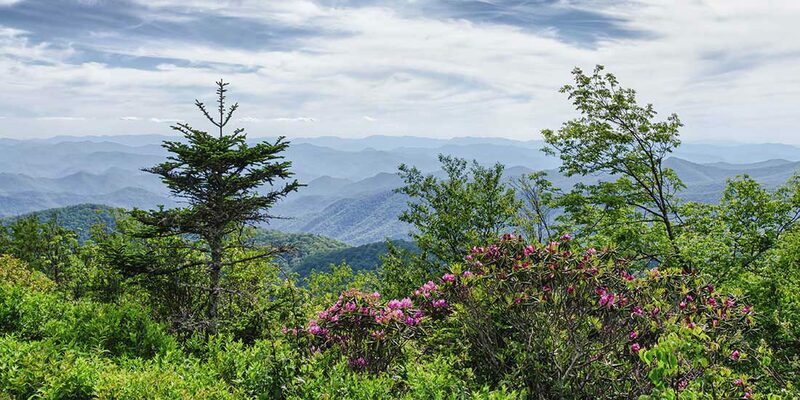 The Blue Ridge Parkway’s location on the Appalachian mountains, gives this natural oasis one of the most diverse, spectacular floras on the planet. With 1,500 species right now, the number is expected to could go up to 2,000, after a more extensive documentation. The primary reasons for this amazing diversity, are the hospitable climate, perfect for plants, as well as a wide elevation range, and an abundance of micro-habitats. Visitors will get to enjoy an exceptional variety of blooming wildflowers and imposing trees. More than a hundred of tree species, have found home in the Blue Ridge parkway, giving it a variety of forest types as well. Lower levels are primarily inhabited by chestnut-oak forests, as well as timbers, in remote, not easily accessible forests. Going higher, there is the northern hardwood forest, characteristic for New England. These forests are rich with birch and buckeye. Reaching the peaks of the Parkway, spruce-fir forests begin to dominate, contributing to this spectacular, diverse forest collection. This is where the Blue Ridge Parkway shows its full glory, and diversity. The region is rich with amazing, vibrant wildflower species, making this a herbalist’s paradise. The blooming process of the flowers begins in spring, and ends at the end of October, allowing the camp visitors to enjoy a wide variety of flowers, from tiny ones, all the way up to imposing flowers, such as the Goldenrod. The region is a perfect breeding ground for flora, as it has a high precipitation, all year-round, paired with a rich soil, and excellent climate conditions. 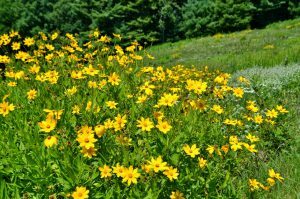 Wildflowers have especially benefited from this, and today around 1,300 different species can be found in the Parkway. This might be a problem with some other areas, as blooming of so many species would be hard to accomplish, but plants in the Parkway have found an amazing way to avoid this problem, as they bloom at different periods during the year. Early spring would be the prime time for blooms to decorate the entire forest with their beauty. Chickweed, Wild Ginger, Liverleaf, Toothwort, Spring Beauty, Trout Lily, Trillium, Larkspur, and Foamflower are only some of the gorgeous plants blooming in the spring. As the year goes on, wildflowers such as Turkâs Cap Lily, Meadow Rue, Evening Primrose, Bellflower, Bee Balm, Impatiens, and Turtlehead also begin to bloom, and even by the end of the season, some exotic species such as Aster or the Blazing Star contribute to the Blue Ridge Parkway’s incredible floral diversity. As one of the most hospitable areas for plants in the United States, the Blue Ridge Parkway is home to a truly captivating collection of forests and wildflowers. Blossoming all year round, many species have adapted to coexist in this serene place. Unfortunately, numerous poachers threaten to damage the balance of the area’s flora, so be careful not to interfere with wildlife when visiting the Parkway, as it is strictly forbidden.